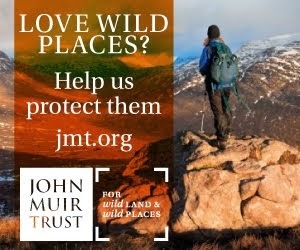 A forecast of strong winds and showers, some of them wintry, didn’t bode well for two days leading groups in the Cairngorms for the Tomintoul & Glenlivet Walking/Cycling Festival. 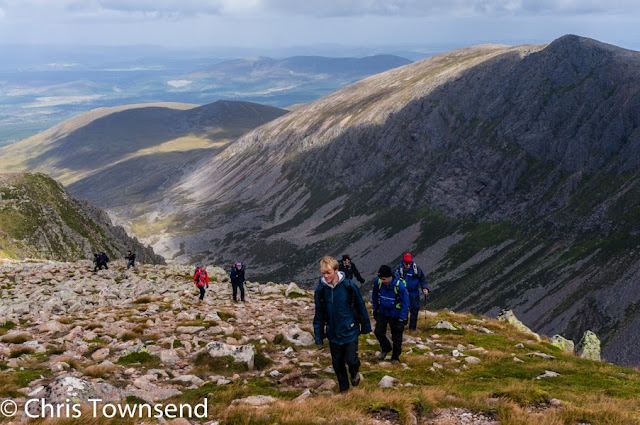 I hoped the weather wouldn’t lead to a failure to reach a summit, as it did last year when I attempted to lead a group up Ben Avon. As ten of us gathered in the Sugar Bowl car park on the Cairngorm ski road clouds were racing overhead and gusts of wind shook the trees. 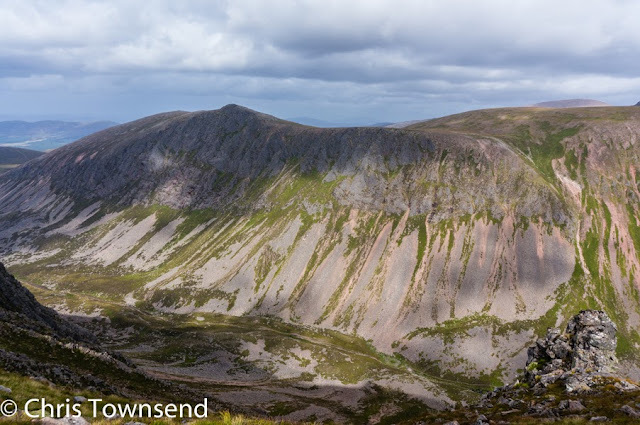 We were aiming for Braeriach, which involves a long approach walk via the boulders of the Chalamain Gap followed by a descent into the Lairig Ghru. Buffeted by the wind I wondered just how far we would get as we began the climb up Braeriach itself. There were short, sharp and cold showers and as we neared the summit we were in and out of mist but the wind wasn’t strong enough to impede walking. The views came and went in the cloud; dramatic, atmospheric, magical. The air was cold and a shower near the summit had hints of sleet. Hats and gloves and hoods were essential. A suggestion and reminder of winter at the end of August. Descending the same way the wind strengthened and grew more gusty. An hour or two later and we might not have reached the summit. At the same time though there were touches of sunshine and a brighter sky. Showers still blasted past, mostly only minutes long. 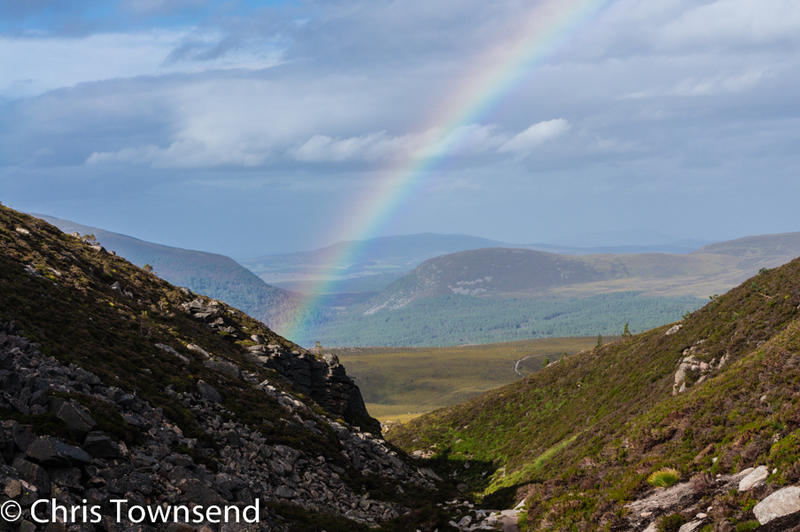 As we clambered back through the Chalamain Gap a rainbow appeared ahead, welcoming us back to Glenmore. A day later and I was in Glen Feshie with seven others, ready for an ascent of Sgor Gaoith. The skies were greyer and the wind stronger than the day before and we were in wet mist much of the time. Thin rain swept over us. There were no clearances and the group sadly missed the tremendous views from the summit. 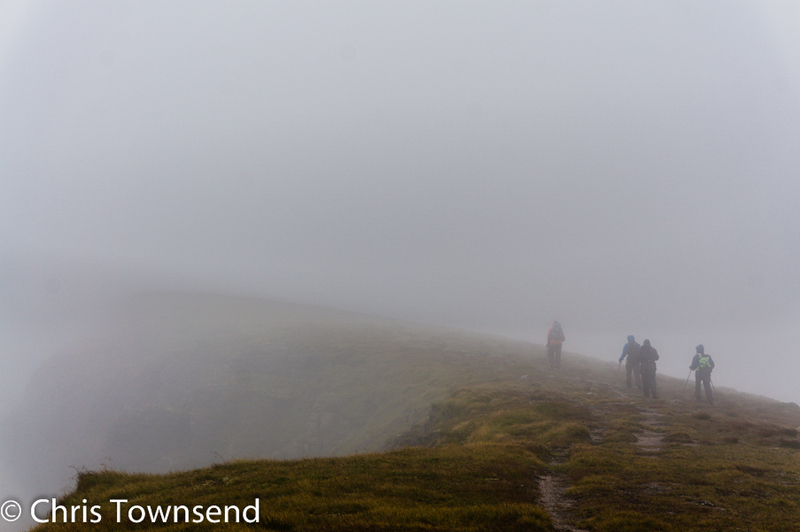 Arriving in thick mist I was initially confused at the top. The little cairn that decorated it was gone. Maybe this wasn’t the summit? A few yards walk and a look back showed that it was. The cairn had been there earlier in the year and, as far as I remembered, on all the other occasions I’d climbed the hill. There were no stones remaining and I guessed they’d been chucked over the cliffs down towards Loch Einich. It was only a little cairn and I guess another will appear but it seems a shame the old one has been destroyed. 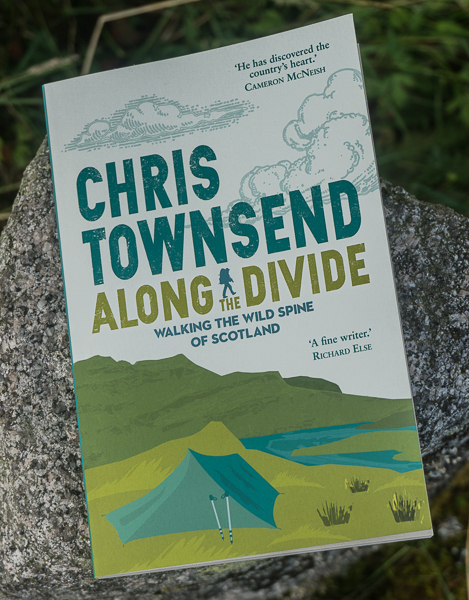 I’m not in favour of lines of cairns marking paths but cairns marking summits are useful and valid and often of great age. We’d ascended via a high broad curving spur over two lower summits. 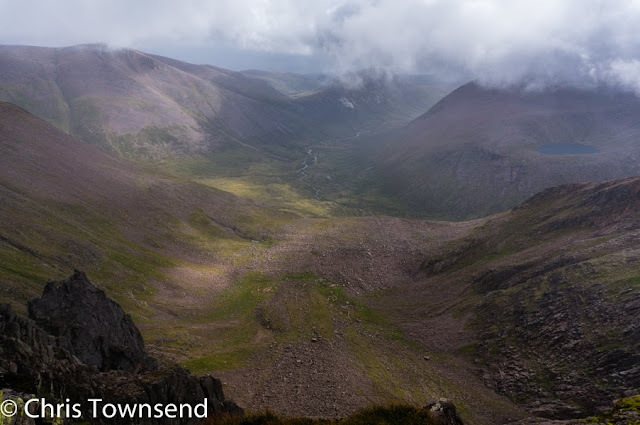 To escape the wind we took a direct descent, straight down mossy slopes into Coire Ruadh and out of the mist. We followed a burn down and saw dippers beside it. There were red grouse in the heather too and one of the group saw a golden eagle flying up Glen Feshie. On the ascent we’d seen a solitary reindeer far from their usual haunts. This one was more wary than usual too and trotted away before we came near. Other than that the hills were empty, of people and wildlife. 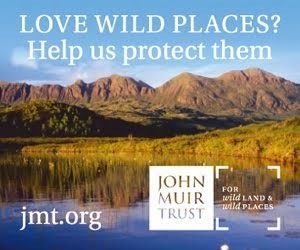 Sounds it was a good choice heading to more protected areas. There's generally more to see. The cairn thing... I see it too that they are appearing everywhere here in Colorado. I don't like them everywhere but I see no sense in disturbing them. The ones that are disturbed are rebuilt and new rocks are used even if the old ones didn't get thrown over the edge. Sooner or later there will be no rocks or at least no rocks that haven't been disturbed. Sounds like a couple of bracing days out! Sorry to hear about the cairn. I must admit ever since i started hill walking as a kid i've had a great fascination with them. As you say many off them are of great antiquity and when alone in the mist and snow i still find them a great reassurance that i'm walking in the footsteps of my ancestors and not off the edge of a cliff!